NY: Hyperion, 2000. Book. Near Fine. Cloth & Boards. 1st Edition. 8vo -9.5 in tall. . Almost new, light wear to jacket edges. Tiny red line on top edge near spine. Text clean. Include 32 pp. glossy b&w photos. Autobiography of the queen of gossiip columnists. 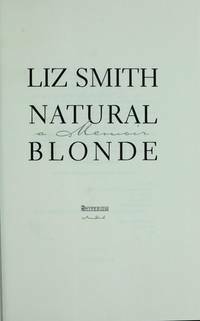 She relates how she made it out of Texas and found fame in NYC..
Old Tappan, New Jersey, U.S.A.: Lisa Drew/Scribner, 2003. Book. Very Good. Trade Paperback. 1st Paperback Edition.. 237 pp. Close to new, no markings, no spine creases, a few corner creases. 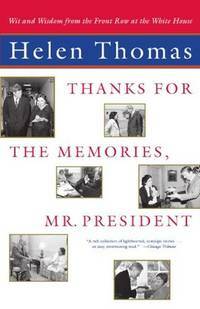 Helen Thomas gives us the lighter moments of her press-conference jousting with presidents from JFK to GWB. Size: 8vo -- 8.5 In Tall. Boston: Bedford/St. Martin's, 2002. Textbook. Good. Soft cover. 5th or later Edition. 8vo - 9 in. tall. Some pages are rippled at the bottom. Text clean, no markings or highlights. CD-ROM included in rear pocket. Index. 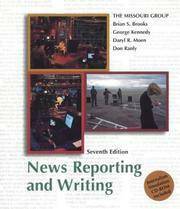 Textbook for introduction to news writing. Includes exercises, many examples of techniques. Seventh edition. Useful not only for journalism but any type of expository writing. .
NY: NY: Bantam, 1991, 1991. Book. Very Good. Cloth & Boards. First Edition. 8vo - over 7¾" - 9¾" tall. 480 pp. with 16 pp. glossy b&w photos. No markings, nearly new. Slight edgewear on spine, a small dot on front cover. Firm binding. Rivera recounts his checkered career in television, criss-crossing between news and entertainment, and sometimes blurring the boundaries of both. 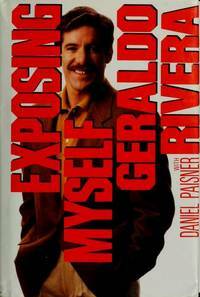 He was the first Hispanic to achieve national stardom in the television news business, but then became somewhat of a joke with his hyperemotional commentaries..
NY: NY: Berkley Publishing Group, 2004, 2004. Book. Fine. Trade Paperback. 1st Paperback Edition. 8vo - over 7¾" - 9¾" tall. Trade Paperback. Fine. 1st Paperback Edition. 8vo - over 7¾" - 9¾" tall. 432 pp., 16 pp. b&w glossy photos. Marketing releases laid in. New, no markings. 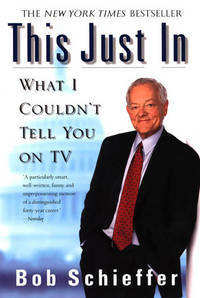 Subtitle: What I Couldn't Tell You on TV. CBS news veteran Bob Schieffer covers his 40 years in the news industry..
New York: Associated Press, 2013. Magazine. Very Good +. Magazine. 28 pp. Lightly read AP house organ with feature promoting AP's new book "Vietnam: the Real War." Cover shows b&w photo of a GI in Vietnam sniffing a letter from a girlfriend back in Oklahoma. Article by Mike Silverman includes more information and photos from the Vietnam book. Other articles deal with the Naibobi AP bureau; photo transmission methods over the decades; a look back at WW II coverage by Max Desfor and George Bria. Size: 4to -- 11 in Tall. NY: George P. Rowell & Co., 1879. Book. Fair -. Decorative Boards. 532 pp. Boards present but detached, spine cloth missing. Textblock intact. Pencil squiggles and arithmetic on endpapers. Publication date not present but likely 1879 or 1880, considering references to 1870 Census and dated quotations about newspapers. A quarterly listing of all newspapers and periodicals in the U.S., arranged by state and city. Most of the newspapers are now long gone or merged. Rear sections include lists of specialized publications by topic; foreign language newspapers; Canadian publications, plus several dozen pages of ads for individual newspapers seeking advertising. Formerly owned by Herbert "Tippen" Davidson Jr., deceased publisher of the Daytona Beach News-Journal (now owned by the New Media Investment chain). Size: 8vo -- 8.25 in Tall. NY: Random House, 1997. Book. Very Good +. Cloth Tape & Boards. 3rd Printing.. 424 pp. Nearly new. Faint red line on top edge near spine. Previous owner's name on endpaper. A few checkmarks and a few words written on 3-4 pp. Otherwise clean. Binding firm. Scores of authors, reporters and political VIPs give colorful anecdotes about how they wrote one of their books or came up with the idea for the book. 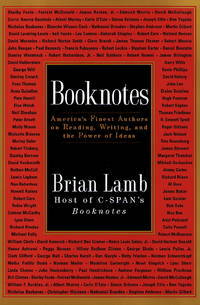 Material originally was presented in interview form on C-SPAN's "Booknotes" program. As a whole, the anthology shows there's no right or wrong way to write a book, only that it's usually a time-consuming feat. Size: 8vo -- 9.5 In. NY: Warner Books, 1987. Book. Good. Mass Market Paperback. Reprint.. 164 pp. Edge chipping, light toning. spine creased, but binding still firm. An old-school Chicago reporter is bludgeoned to death. Others at his newspaper know something about the murder that is being blamed on a black messianic group. Written by Granger under the Joe Gash pseudonym. Size: 12mo -- 6.75 in Tall. Indianapolis: Bobbs Merrill, 1936. Book. Good +. Cloth. First Edition Stated.. 375 pp. red cloth with gilt titling, still mostly bright. Corners bumped, one inch slit along spine exposes backing strip. Spine darkened. Text clean. A look at U.S. history as reported as breaking news in excerpts from various newspapers -- from colonial times up until the breakout of World War 1. The book shows how initial jopurnalistic reporting of events can shape political attitudes. Size: 8vo -- 9 in Tall. Daytona Beach, Fl. : Daytona Beach News-Journal, 2007. Ephemera. Very Good. Stapled Softcover. Issue 37.. 12 pp. Gently used. Monthly leaflet serving as an internal newsletter for the 800-plus employees of the Daytona Beach News-Journal and its Pennysaver shopper. Cover photo shows a Nigel Cook photograph of the Space Shuttle traversing a night sky over the Halifax River in Daytona. Inside items note various charity projects, anniversaries and births, plus photos from the annual "Cookie Party." Plus an explainer on a new health insurance plan offered by the Florida Health Care HMO. Historical note: The newsletter reflects the "family" atmosphere that was promoted by then-owner Herbert "Tippen" Davidson when the newspaper was at its financial peak. In subsequent years, management strife and advertising declines resulted in the paper being sold to coporate chains (at first, Halifax Media Group, and later, GateHouse.) and more than half its workforce eliminated. Size: 4to -- 1 in Tall. NY: Counterpoint (Perseus), 2002. Book. Near Fine. Trade Papeback. 1st Printing Stated... 650 pp. Close to new, small slash mark on top edge near spine. Lightly thumbed. Index. 16 pp. glossy b&w photos. Crisp and square. With introduction by his daughter,Josephine Hammett Marshall, and a preface by Layman, his biographer. Hundreds of letters gathered from relatives and friends of the deceased master of the hardboiled detective story. Many were directed to his immediate family but a large number were written to Lillian Hellman, longtime friend and mistress. 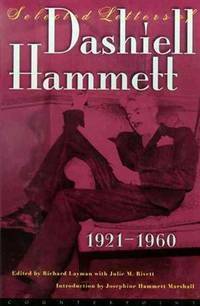 Hammett is open about his many flaws, including drinking, and his experiences with Hollywood's blacklist against leftists. Size: 8vo -- 9 in Tall. Ann Arbor, Michigan: University Microfilms, 1968. Book. Illus. by Barrow, Henry C.. Very Good. Cloth. Reprint.. 506 pp. Gilt titling still mostly bright against red cloth. Bumped corners. Text mostly clean except for a few vertical lines in margins of one or two dozen pages, marking varuious paragraphs. Endpapers clean. Detailed narrative of how newspapers began sharing news in 1848, and expanded into an ever larger cooperatilve through 1940, and the opening years of World War 2. The history also touches on the rise of archrival United Press circa 1900. Several full-page b&w sketches of great moments in news-gathering add drama to the account. This is a reprint of the 1940 original edition. Size: 8vo -- 9 in Tall. Syracuse, N.Y.: Syracuse University, 2014. Magazine. Very Good. Magazine. Vol. 26, No. 1.. 28 pp. Gently read, nearly new. An issue of the quarterly alumni magazine of the Newhouse School of Public Communications at Syracuse University. This issue celebrates the 50th anniversary of the Newhouse School on the SU campus. The cover shows a historical photo of President Lyndon B. Johnson in an academic gown cutting a ribbon, dedicating the first building of Newhouse, now occupying three buildings. LBJ is shown with Lady Bird, NY Governor Nelson Rockefeller, wife Happy Rockefeller and SU Chancellor William P. Tolley. The dedication ceremony is remembered today for LBJ's Gulf of Tonkin speech, which asserted North Vietnam had attacked US Navy ships, including the destroyer USS Maddox. The magazine article noted LBJ received a standing ovation. It omitted any mention that years later, most historians regarded the speech as an exaggeration or fabrication of what actually occurred. The article also recounts the $15 million gift that publisher S.I. Newhouse provided to expand SU's journalism program. Size: 8vo -- 9 in By 9 in Square Format. By Dearmond, R. N., Ed. Skagway, Alaska: Lynn Canal Publishing, 1990. Book. Fine. Trade Paperback. 2nd Edition.. 237pp., plus 8 pp. glossy b&w historical photos. Nearly new, tight, clean, no markings, slight wear along top edge of spine. An anthology of columns written by newspaper reporter Elmer White circa 1900 during the Klondike Gold Rush in northern Alaska. Size: 8mo -- 8.5 In Tall. Old Tappan NJ: Scribner, 2000. Book. Fine. Cloth Strip and Boards. First Edition.. 288 pp. Crisp, like new, no markings. 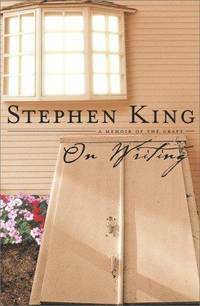 Informal, readable pointers from horror writer Stephen King on writing fiction. Includes a suggested booklist of his recent favorites. Size: 8vo -. By Pleasants, Julian M., Ed. U.S.A.: University Press of Florida, 2003. Book. Fine. Cloth Strip and Boards. By Author. First Edition.. 343 pp., index, reading list. As new. Inscribed by Pleasants to Tippen Davidson, then publisher of the Daytona Beach News-Journal. "Thanks for your valuable contribution to this volume." 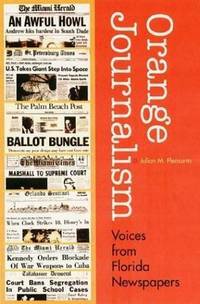 An anthology of oral history interviews with 15 Florida newspaper publishers, editors, columnists and others, including material from Gannett's Al Neuharth, David Lawrence, Edwin Pope and Carl Hiaasen of the Miami Herald, and Lucy Morgan of the St. Petersburg Times (now known as the Tampa Bay Times). Others represented include Davidson, Garth Reeves of the Miami Times and Diane McFarlin of the Sarasota Herald-Tribune. A 12-page preface gives an overview of Florida's newspaper industry. The project was sponsored by the Florida Press Association. Many interesting historical anecdotes and a variety of opinions about Florida's explosive growth. A great deal of self-congratulatory optimism, with apparently little recognition that the Internet just around the corner would force major cutbacks in pages and staff at virtually every newspaper in the state. Scarce association copy. Size: 8vo -- 9.5 In..
Washington DC: Georgetown Univ Pr, 1989. Book. Very Good +. Trade Paperback. First Paperback Edition.. 156 pp. Light wear, text clean. A veteran UPI reporter discussed the limitations and innate biases of US mainstream journalism. He recounts his own experiences covering the White House and foreign beats. Index, annotated bibliographic notes. Size: 8vo. NY: Ticknor & Fields, 1987. Book. Good. 257 pp. Some dampstaining on cover and light rippling. Lightly read. A collection of 64 articles and columns by Trillin, written for the Nation and King Features from 1985 through 1989..
Gainesville, Fl. : Univ of Florida Press, 1988. Book. Near Fine. Trade Paperback. By Author. 1st Paperback Edition.. 175 pp. Nearly new. An Orlando Sentinel review of the book was laid in front, leaving a yellowish acid shadow on the inside cover. Otherwise clean. Signed "Regards, Patricia Acton April 1989" on half-title page. Fascinating, detailed account of the lawsuit Marjorie Kinnan Rawlings faced after publishing "Cross Creek" in 1942. Zelma Cason, a former friend and neighbor of Rawlings, resented the way she was depicted in the memoir, and sued for $100,000. Cason won the case on appeal but with only nominal damages. The four-year legal battle left Rawlings tired and depressed, but later on she resumed friendship with Cason. Size: 8vo -- 8.5 In Tall.